This party was so fun to create. I imagine a little boy with unruly curls wearing an argyle bowtie to match the decorations. Sidebar: I don't usually create parties that have absolutely nothing to do with my kids, so this one had them entirely confused. Who's turning one? Is this for someone's birthday? Do we still get to eat the cupcakes? First off, the invite. It's for a wee little one, so why shouldn't the invite be tiny as well? It's only 3x5 inches and perfectly whimsical. I chose to handwrite all of the labels, but you could always design and print something on your computer. 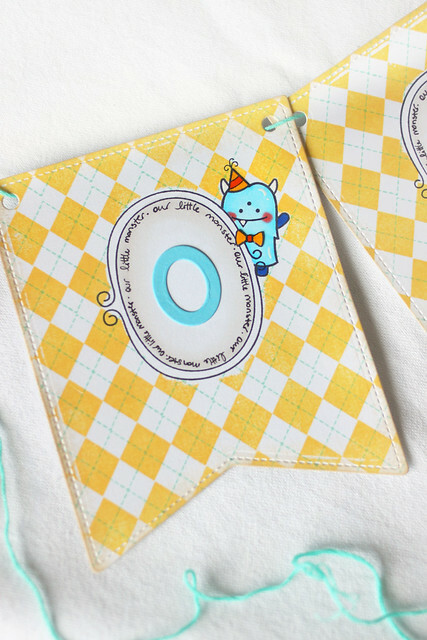 All of the decorations feature the same focal design: the frame from sweater weather (where I hand-cut the inside oval, since the dies hadn't arrived at the time!) and the 3-eyed monster from monster mash, decked out in a party hat and bow-tie. 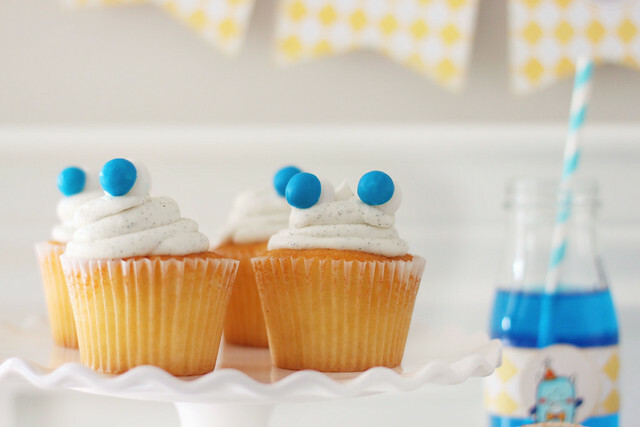 Wondering what to serve at a preppy monster party? Stinky feet sandwiches. Bonus points if you use a foot cookie cutter. 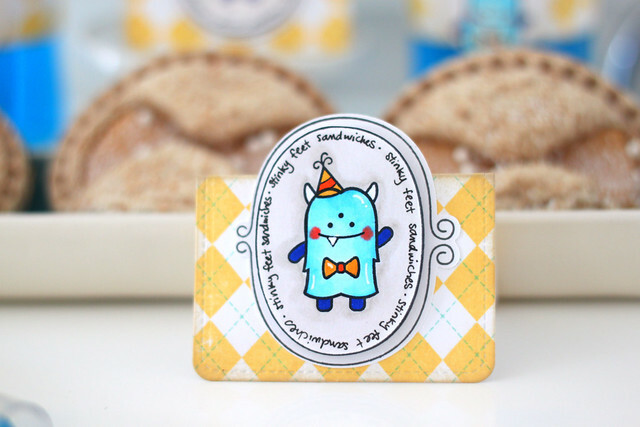 I folded a journaling card die in half for all of the food labels. Tip: I stamped an entire sheet of white cardstock with the argyle pattern and then die-cut the best parts for all of my decorations. My shaky hands mean that lining up patterns isn't always the easiest thing for me to do! 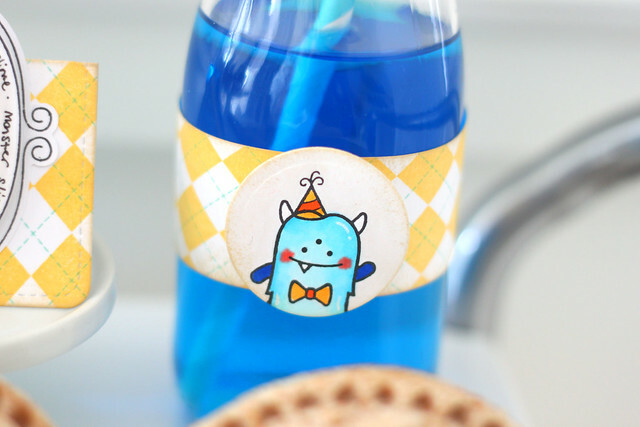 A few drops of blue food coloring to jazz up the bottles of water help to add some pops of color to the party table. The label that goes with the water bottles reads monster slime. The kids loved that one! 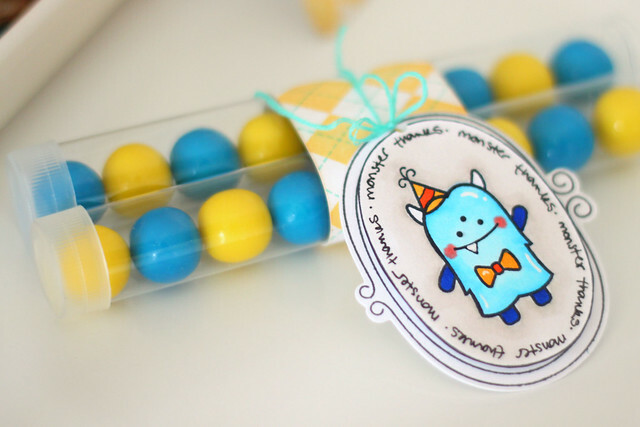 For the favors, I slipped blue and yellow gumballs into plastic tubes and tied them together with a monster thanks tag. 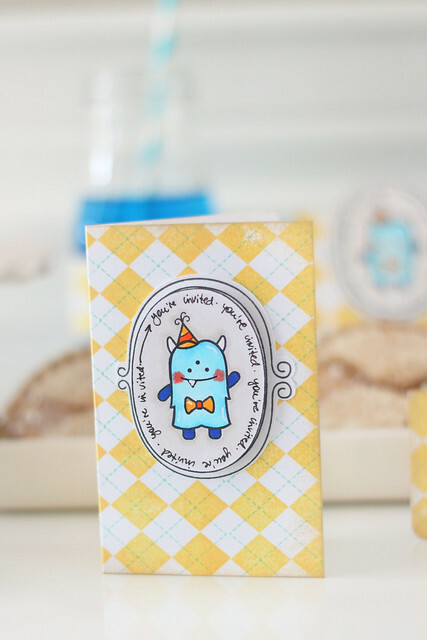 I'm on the lawn fawn blog today too, and if you click there you'll find a photo tutorial for how to create the banner panels, with the cute little monster peeking out from behind the frame. I hope you like this month's party! Thanks for stopping by! 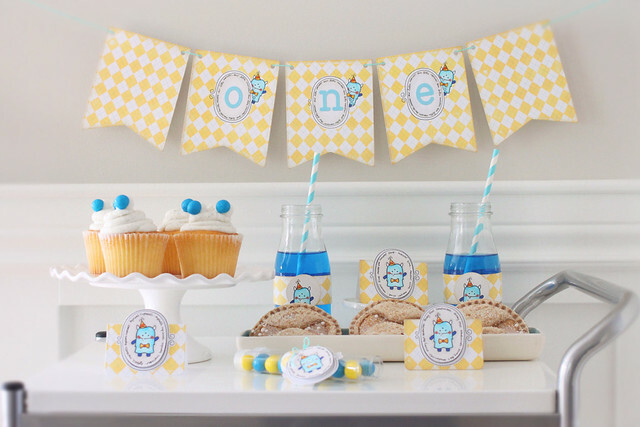 aww I love when you do your little party theme projects.. this is SO CUTE.. So cute! I love it all!!!! Oh my goodness, Elena!!! 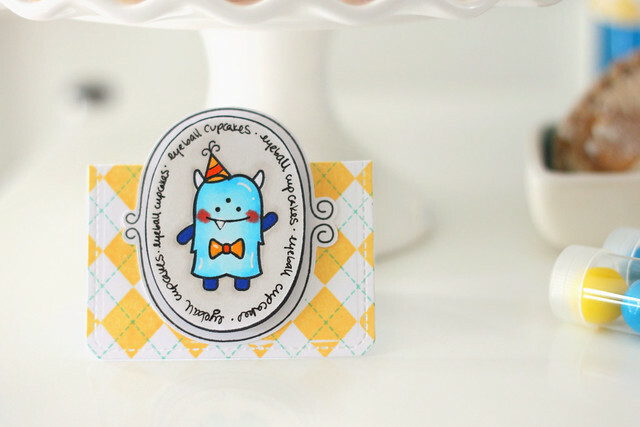 I always LOVE your party themes and this preppy monster party is AMAZING!!! Fabulous job!!! And I've added a half dozen items to my wish list because of this post----hehehe!!! I think I just died of cuteness XD! This is so adorable Elena! I absolutely love all of the little details and the way you colored the little monsters! I also really like your tip of stamping the entire argyle pattern on one large sheet, that's genius! How adorable!! I love it! Great job! So so cute!! I love to finally see what everything came up!! Your parties rock! !